I’m looking for a PHP programmer looking for an challenging position in the Lexington area. Our code uses the Cake PHP framework, and we’ve got several projects with a certain amount of shared code between them. Our biggest projects are ClearMyRecord.com and Hard2Hire.com, both of which are about helping people get their lives back together in one way or another. I’ve got job postings on Monster.com, but I’ve found that finding people by word of mouth and personal contacts is way more effective than any of the job boards, both in finding the people with the skills and finding people who are likely to be a good fit for the team. Ideally, we’re looking for someone with some OO PHP experience, and some knowledge of, or experience with, MVC methodologies. If you’ve used Cake, that’s great, but it’s certainly not required. And if you have MVC experience in some other language, like Ruby on Rails, or Catalyst, that actually translates pretty easily into what we’re doing, particularly if you’re interested in learning new things, and can convince me that you’re the right person for the job. If you’re interested, or know someone who is, or want more information about the position, please contact me. After many years of saying “I really should take a look at CakePHP”, I’m finally doing something useful in it. And it’s marvelous. What’s fascinating to me about shiny new technology like this (new to me, that is) is that I’m almost always reluctant to get started, and I’m almost always thrust into it by a co-worker who says that it’s the way to go, and starts doing stuff in it. This was the case with Apache, Perl, mod_perl, POE, PHP, AJAX, and now Cake. Also, as usual, I am incapable of learning anything in it until I’m doing an actual useful project in it. I can’t just work through the tutorial, or make up a project. It has to be something that’s important to me, and is at least a little interesting. And, as usual, my reaction here is, why the heck didn’t I jump into this years ago. Can you imagine the time and pain it would have saved me? 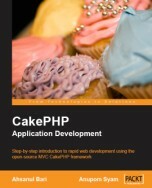 For those of you who don’t know, CakePHP is an MVC framework. Which is to say, it’s just like Ruby on Rails, or Catalyst, or any of a dozen other frameworks out there. As it turns out, with most web applications, 90% of the work is doing the stuff that you’ve already done before on every other web application that you’ve ever written. Database connections, getting data, creating data, updating data, deleting data, asking the user if they’re sure they want to delete the data, etc, etc, etc. Very boring. Cake (and other frameworks) do that stuff for you, so that you can focus on the actual business logic of the application – that is, the things that make this web app different from the last 28 that you’ve already written.